Barack Obama was poised to reach a major milestone Tuesday in the Kentucky and Oregon primaries - a majority of the pledged delegates offered in the Democratic presidential contest - even as Hillary Rodham Clinton soldiered on despite her dwindling hopes. Clinton vowed to continue the fight through the last primaries in early June as she campaigned Monday across Kentucky, a state she was expected to win by a wide margin. Obama was favored in Oregon, where supporters delivered the largest crowd of his campaign on Sunday in Portland. Regardless of who prevails in those states, Obama was assured that he would be able to claim the largest share of pledged delegates who could be won in the long slog of primaries and caucuses since the snows of January. The Illnois senator's campaign is touting the pledged delegate milestone as a big step toward ending the epic nomination battle with Clinton. Taking a majority among the pledged delegates could help Obama's case with undecided superdelegates - the party insiders and elected officials who are not tied to primary or caucus results - to pick up the pace of their endorsements. Superdelegate support is crucial because neither candidate will have enough delegates from the remaining primaries to clinch the nomination without them. Including superdelegates, Obama had 1,909 delegates to Clinton's 1,714 in the latest CBS News count as he goes into Tuesday's primaries, in which 103 delegates are at stake in the two states. By early Wednesday, Obama could be less than 75 delegates short of the total 2,026 needed to nominate a candidate at the party's national convention in Denver in late August. Republican John McCain has already been targeting Obama in his campaign speeches as his likely opponent in the November election. On Monday, McCain accused Obama of inexperience and reckless judgment for saying Iran does not pose the same serious threat to the United States as the Soviet Union did in its day. Obama called for "tough, disciplined and direct diplomacy. That's what Kennedy did; that's what Reagan did." Obama's "words sound strong, but he is playing defense, and you'd think he wouldn't want to be doing that, especially against John McCain," said CBS News correspondent Dean Reynolds. "As we near victory in one contest, the next challenge is already heating up," Obama campaign manager David Plouffe wrote in a memo to supporters Monday. "President Bush and Senator McCain have begun coordinating their attacks on Barack Obama in an effort to extend their failed policies for a third term." Obama has been increasingly presenting himself as the nominee as he looks ahead to the battleground swing states in the general election. On Tuesday night, he planned to hold a rally in Iowa, where he won the leadoff caucuses in early January to emerge as the front-runner. CBS News estimates that Obama has won 1,606 pledged delegates - leaving him just 21 short of a majority of the 3,253 pledged delegates up for grabs. He is sure to cover the gap in Tuesday's primaries even if he does not win either state, because the delegates are allocated proportionately. Of the 800 superdelegates, about a quarter of them have not declared support for either candidate. On Monday, Obama picked up six more superdelegates. Clinton added none. Obama, seeking to become the U.S.'s first black president, won the endorsement of Sen. Robert Byrd of West Virginia, the longest-serving senator in history and a former member of the white supremacist Ku Klux Klan and one-time opponent of civil rights legislation. Nationally, Obama holds his largest lead yet over Clinton in the Gallup Poll, 55 percent to her 39 percent. The poll, released Monday, was conducted among 1,261 Democratic voters and has a 3 percentage point margin of error. Back in mid-January, Clinton held a 20 percentage point lead in the Gallup Poll. Clinton has mounting campaign debts and has been unable to muster much support from uncommitted superdelegates. But she vowed there was "no way that this is going to end anytime soon" as she campaigned Monday in Kentucky. The New York senator soldiered on through event after event, ending her night Monday in Louisville before a crowd of several hundred, her voice raspy from the stage. "There are a lot of people who wanted to end this election before you had a chance to vote," she said, husband and former President Bill Clinton at her side. "I'm ready to go to bat for you if you'll come out and vote for me." She argued at one stop that she is the "more progressive candidate" and dismissed Obama's large crowds, like the record rally by an estimated 75,000 in Portland on Sunday. Clinton said Obama, who has refused to debate her since before the Pennsylvania primary last month, would "rather just talk to giant crowds than have questions asked." Obama campaigned Monday in Montana, where voters will join those from South Dakota on June 3 in dropping the curtain on the 2008 primary and caucus season. The Illinois senator rarely mentions Clinton now, except to praise her "magnificent" campaign - praise he can now afford to give his rival. He is tangling almost solely with McCain in a prelude to the general campaign for the November election. Obama sought Monday to exploit McCain's ties to lobbyists, drawing a contrast between the Arizona senator's reputation as a reformer and his relationship to special interests in his campaign. McCain recently adopted conflict-of-interest guidelines that led to the departures of several campaign aides due to their links to lobbyists. "The fact is, John McCain's campaign is being run by Washington lobbyists and paid for by their money," Obama argued in Billings, Montana. "I'm not in this race to continue the special interest-driven politics of the last eight years. I'm in this race to end it." McCain, in Savannah, Georgia, dared Obama to follow his lead on the guidelines. "We have enacted the most comprehensive and most transparent policy concerning lobbyist activities, and I challenge Senator Obama to adopt a similar policy." Although Obama does not take money from federal lobbyists and political action committees, he does accept cash from state lobbyists and corporate executives interested in issues before Congress. He has had unpaid advisers with federal lobbying clients, and some of his campaign officials were lobbyists before. McCain on Monday continued his theme that Obama is naive about international issues, accusing him of recklessness for saying Iran does not pose the same serious threat to the U.S. as the Soviet Union did in its day. "Such a statement betrays the depth of Senator Obama's inexperience and reckless judgment. These are very serious deficiencies for an American president to possess," McCain said in an appearance on Obama's home turf of Chicago. McCain listed the dangers he sees from Iran: It provides deadly explosive devices used to kill U.S. soldiers in Iraq, sponsors insurgents in Iraq and elsewhere in the Middle East and is committed to the destruction of Israel. Responding to McCain, Obama told a rally in Montana, "Let me be absolutely clear: Iran is a grave threat." But the Soviet Union posed an added threat, he said. "The Soviet Union had thousands of nuclear weapons, and Iran doesn't have one." 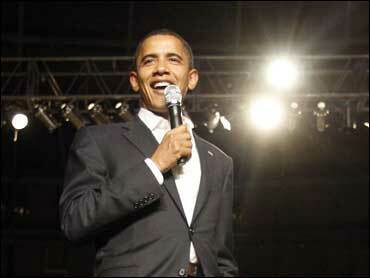 Obama returned to the theme during a noisy rally before more than 7,000 backers in Bozeman, Montana. "He and I are in a big argument right now because I said we should talk not just to our friends, but we should talk to our enemies," said Obama. "He wants to pursue the same failed policies of George Bush, talking tough and not getting anything done. We've got to change our foreign policy."